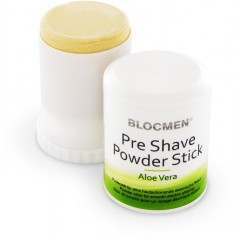 BLOCMEN is a pre shave powder stick available in three different variations; Aloe Vera, Derma and Original. The range of powder sticks have been effectively designed to provide gentle skin care as you dry shave with your favourite electric shaver. One of the range’s main active ingredients is Talc, which has the ability to enable a smooth glide of the shaver, preventing skin irritation and redness. No matter your skin type, there’s a pre shave powder stick suitable for you. BLOCMEN not only helps to provide a noticeably smoother dry shave, but also helps to protect the shaver head and prolong its lifetime. 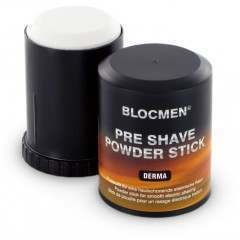 Once applied, BLOCMEN absorbs moisture and enables a smooth gliding of the electric shaver over the skin. 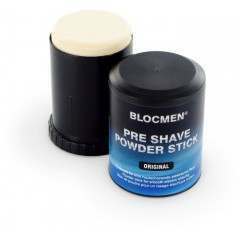 BLOCMEN Pre-Shave is used before dry shaving, with the talc ingredient absorbing sweat and grease to help provide a skin-caring shave. BLOCMEN Original is ideal for use after a shower when the hair is naturally softened. Each powder stick ensures there is a product to suit your skin type.